Thailand can be divided into five main culinary regions, the north, the northeast, the south (including the Gulf of Thailand), the central plains, and Bangkok. Each region has its own cooking style according to available ingredients and local tastes. Try sampling recipes from the various regions to get a feeling for Thai cooking as a whole -- you will find your culinary instincts relate better to some areas more than others. This, in turn, will give you a clue as to where you might like to travel if ever you have a chance to visit Thailand and taste Thai food at its magnificent source. Until the late 1800’s, this region of Thailand existed almost as a separate kingdom, with a fortress composed of rivers, mountains, and trees. Within this isolation, the northern Thai people developed a distinct dialect as well as their own unique style of cooking. Unlike the south, there are no coconut trees, hence no coconut milk. Unless it is brought in or comes from a river, fish is not eaten in this landscape of hills, valleys, and farmland. Red meat of all kinds is more common here, along with various vegetable dishes (both raw and cooked). Sticky rice is eaten daily, not necessarily as a dessert (like in other regions), but to accompany these spicy meat dishes. Although the cuisine of this region used to be based primarily on red meats, today there is an abundance of vegetarian and vegan restaurants. This recent influx stems from the spiritual atmosphere of the city and its focus of peace and well-being. Organic produce -- and restaurants that use them -- are also becoming popular and readily available. An example of a northern curry is Thai Jungle Curry. Other dishes from northern Thailand include various types of spicy dips used to add flavor to raw vegetables, or used as a wrap as in lettuce wraps. The Northeast is perhaps the poorest region of Thailand, also known as Isaan. Droughts are common, and the heat during the day can be oppressive. Like the north, fish and coconut milk are not readily available for everyday home cooking. When animals are eaten, no part is left to waste. Beef (including tongue, stomach, intestines, heart, and liver) is common, as are chicken, pork, and even boar. Cooking methods here include much roasting or broiling. 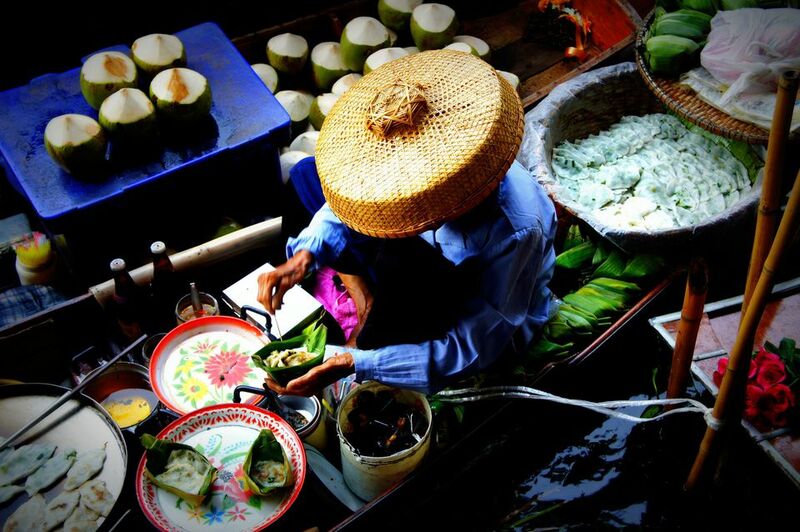 Clear curries are popular, while the most famous dish of the region is Green Papaya Salad, often eaten with sticky rice. The region south of the capital forms a long peninsula that joins with Malaysia. A long mountain range follows the peninsula from north to south, while palm trees and white-sand beaches line the coast. Just off the western side of the peninsula lie a plethora of islands, many of them famous (such as Phuket) for attracting millions of international tourists each year. Fishing is another main industry. The coastal area on the eastern, gulf side is also known for fishing as well as the large-scale production of fish sauce, one of the most important ingredients in Thai cooking. With its abundance of fresh fish and coconuts, southern cooking tends to be rich in fish and seafood dishes, including coconut milk-based curries. Desserts consist mainly of fresh tropical fruit, such as mango, pineapple, mangosteen, papaya, and many others. Known as one of the great rice bowls of Asia, the central plains make up the heartland of Thailand, consisting of fertile rice farms. Originally this region was a swamp, and it is still prone to flooding during monsoon season. This abundance of water also allows for easier rice production. From this region, tons of fragrant, jasmine-scented rice are exported around the world each year. The cooking in this region includes rice noodles, usually eaten for lunch or as a snack, the most famous of which is Pad Thai. Protein in this region varies from beef to chicken and fish, and desserts made with banana and mango are popular. It has been said that in Bangkok there are more food establishments per square mile than anywhere else on earth. If you were to visit Bangkok, you would believe this claim to be true. The city seems to revolve around food. Everywhere there are indoor and outdoor eateries, as well as "fast food" stalls on most street corners. In Bangkok, food from every region of the country is represented, with the addition of "palace food." The Chinese presence is strong in Bangkok, with a thriving Chinatown that is a must-see for visitors. Palace-style cooking is more refined in flavor than Thai home cooking, and especially in presentation, with intricately carved vegetables (often made into flowers) decorating each dish or included within the dish itself. One last food item that must be sampled on a trip to Bangkok is Thai dessert. Here you will find hundreds of cakes, puddings, jellies, and other desserts, most made from a base of coconut, rice, egg, and sugar. As is the case with savory dishes, Thai desserts also display the difference between palace style and home cooking -- some are beautifully made, while others appear almost repugnant. One such example is something called Sweet Blackened Jelly, made from the brown "hair" on the outside of coconuts. For a real culinary tour of Thailand check out Taste of Thailand Food Tours. This company will literally give you a taste of what Thailand has to offer, from the best in gourmet restaurant cuisine to the most delicious Thai street food -- you'll get to try everything and see the country at the same time.